The rebirth of Google+ continues with another update coming to the social & community site app for Android. This latest update, version 7.5.0 for those keeping score at home, was announced by Googler Luke Wroblewski on his Google+ page and amongst the bug fixes in the update, there are also new feature to retry failed posts in the app. In all, there are 34 specific bugs fixed in this release and 12 additional accessibility issues that are addressed so the team is certainly knocking them out at a pretty good clip. Additionally, Luke points out that further improvements have been made to web page loading speeds, something that was really taken on in the last update to the app. There are also fixes to deal with some crashing issues that were found on LG devices running Marshmallow. The new feature, despite all these bug fixes, is really a great addition. 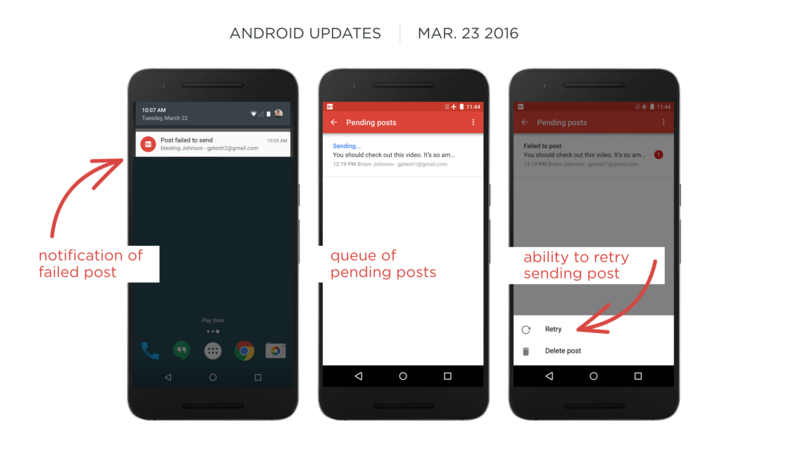 Now you will have the ability to retry sending posts that have failed to post to the site. Now if that happens, your posts that have failed are put into a queue where you can tap and try to resend them. This is great if you are in an area with no mobile signal or say on a plane and having to stay in airplane mode. One thing of note in the post is that the filtering of notifications is disabled currently in the app. We’ve kept the ability to filter Notifications by “all, unread, and other” off in this release as we’re continuing to fix problems with it. While it may not be the answer we want as users, it is great to see the transparency of what’s going on with this feature and the efforts going into fixing it. Assuming that you have Google+ installed on your device, you should see the update come to you over the course of the next few days.